Quinoa: Ancient crop contributes to world food security. Latin American geographer Alexander von Humboldt wrote in the beginning of the 19th century that quinoa was to ancient Andean societies what “wine was to the Greeks, wheat to the Romans, cotton to the Arabs.” Therefore, it is also often called “grano de los Inca” or “grano de oro” (“Inca-grain” or “golden grain”). In its history, quinoa has gone through the stage of being a staple food for Andean inhabitants, a period in which it had the reputation of being the ‘food of the poor’ and has developed into being one of the most expensive gluten-free carbohydrate products, being a ‘food of the wealthy’ (Quinoa: 4.85$/kg in comparison to white rice: 1$/kg or noodles: 1.20$/kg; Source: New York Times, 2011). Quinoa is called the golden grain not only due to its appearance but also due to its many positive properties. In the FAO’s report “Quinoa: An ancient crop to contribute to world food security” the following are mentioned as outstanding intrinsic characteristics: First of all, quinoa has a broad genetic variability which allows for developing superior varieties in the future. Next to that, it has a strong adaptability to extreme climate and soil conditions. Further, its nutritional properties are outstanding since it is a rich source of proteins, phosphorus, calcium and iron and contains all important amino acids. Quinoa also is relatively low in production costs and lastly can be used in many diverse methods. These days, quinoa is popping up everywhere. The Andean countries Ecuador and especially Peru and Bolivia are maintaining their position as leaders of the worldwide quinoa exports. In 2008, Peru and Bolivia accounted for 92% (FAO, 2011) of total quinoa production. In 2013, the quinoa cultivated in Bolivia has increased from 34,156 MT (IBCE, 2013) in 2008 to 61,182 MT in 2013. More than half of it (57.4%) have been exported, meaning 35,108.4 MT (CABOLQUI, 2014). Peru produced around 45,000 MT (FAO, 2013) in 2013 of which 17,070 MT (SUNAT, 2013) have been exported. The Bolivian vice minister expects total production of 95,444 MT in 2014 (Víctor Hugo Vázquez) and it is suggested, that Peru would have the capacity of producing 650,000 MT (Angel Mujica from Minagri). Next to the main producing countries in the South-American Andes, quinoa is cultivated in Morocco, France, Canada and Pakistan. Our task is to keep you updated about exactly that development. Bioversity International provides a document with insightful information about the biodiversity and the context of Andean grains: Balancing market potential and sustainable livelihoods. Published in 2012. The document comprises detailed studies about the market potential of Andean grains, an analysis of livelihoods of quinoa producers in southern Bolivia, insight into small-scale quinoa processing technology and a screenshot of novel products, markets and partnerships in the value chains. Presentation about “Quinoa as an Opportunity” by the Peruvian Minister of Agriculture Milton van Hesse, 2013. “Food Sovereignty and the Quinoa Boom”, a critical dialogue by Tanya Kerssen, 2013. 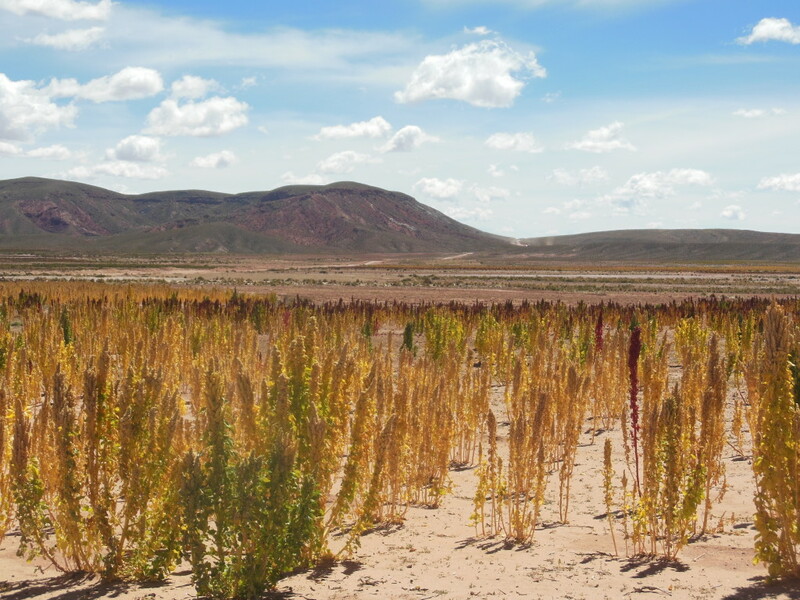 Extensive book about “Collective property and organic, capitalist production: the case of quinoa in the Bolivian Southern Altiplano” by Enrique Ormachea and Nilton Ramirez for CEDLA, 2013. In Spanish! Quinoa in the Netherlands:“Exploration of the Feasibility of a Dutch Quinoa Chain”, by Rens Kuijten.